Trail Effect: I just can't say no to volcanoes. The year was 2010. Chris and his family had taken off on a glorious vacation to Hawaii over Christmas break. 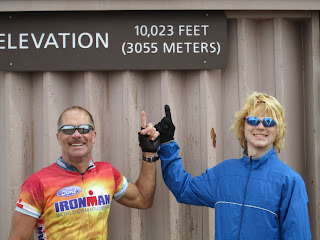 And by vacation, I mean Chris and his dad had concocted this grand scheme to ride their bikes 10,023 ft up a volcano. Sounds like what normal people do in Hawaii, right? Haha. Ha. They did it. Here's some photographic evidence just in case you don't believe me! Knowing that this is a running blog, I'm sure you've guessed what's coming next. In just three short weeks from now we're all headed off to Maui once again to enjoy the glorious sunshine and beaches. But I didn't just write this post to brag about going to Hawaii. I'm writing it because today we officially started training! Training to run up this wonderful volcano of course. Let me say this now. This was THEIR idea. I will take no responsibility for the Cochrane Insanity. Yes, it's a thing. I, on the other hand, now have a problem. Between my goals to become a strong and confident runner, and my absolute and unparalleled love for rocks, I CAN'T SAY NO! I want to run 10,000 ft up a volcano! Shouldn't we have started training for this sooner? Am I strong enough to make it without slowing them down? We started tonight with a run simulating a quarter of the elevation gain, or 2500 ft.
Basically we picked a nice hill with a relatively easy decent near it and ran circles for about an hour and a half. We only needed to do 17 half mile laps, which didn't sounds so bad. Until we started running. Three laps in I'm running down the hill thinking "oh no, I have to do this how many more times?!". After completing the 17 laps, I was surprised how good I felt. We were feeling rather satisfied with our accomplishment until a recalculation on the way home told us we actually should have done 18.5 laps. Better luck next time. I'm attaching a profile of our run to this post, mostly because it looks like a bunch of Christmas trees all in a row, and that makes me happy. Any idiot can run. It takes a special kind of idiot to run up a volcano.